Content: We publish feature articles on all aspects of natural history, conservation and the environment in Ontario: stories about plants and animals, wildlife research, parks and wilderness areas, and environmental issues. ON Nature also runs profiles of Ontarians who are involved in some aspect of conservation or environmental work. We run first-person accounts of soft wilderness adventures in Ontario (canoeing, hiking, back-country skiing, birding trips). We also run articles on environmental/conservation concerns unique to urban areas. At the back of the book, we run short, one-page opinion pieces. We rarely accept articles with a national or an international scope. We rarely write book reviews. We do not publish poetry or fiction. Focus and Style: We’re looking for tightly focused articles that offer an interesting theme and a fresh outlook. Stories should contain in-depth information presented in a lively and accessible style. Sample Copy: Please be familiar with the magazine before submitting ideas. 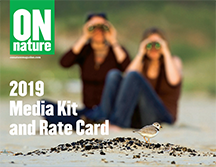 To obtain a sample copy send a cheque or money order for $9.49 payable to Ontario Nature, with your request for a back issue. This price includes cost of the magazine, postage and handling and taxes. Payment: Our rates compare to trade magazines. Payment is 30-days after acceptance. Proposals: Make queries by emailing the editor, John Hassell. We enjoy hearing from ON Nature readers. Please send letters by email to onnature@ontarionature.org or by mail c/o Editor, and include your full name, address and phone number. Letters may be edited for length and clarity. Letters should be 75 words or less and may be published on the website and/or in the printed magazine. What we publish: A full range of articles about wildlife, parks, wilderness areas, environment issues, and nature-related activities. Most of our articles are purchased from freelance writers and are illustrated from freelance photographers’ stock. For the most part, photos only of Ontario species and locations are relevant. We use digital images submitted to noahc@ontarionature.org. For reproduction purposes, digital images should be a high resolution (300 dpi). We will not knowingly publish any photo obtained by the harassment of wildlife, or by the destructive grooming or pruning of habitat. 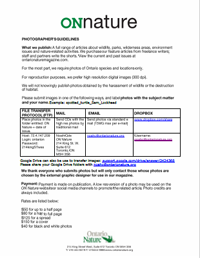 How to Submit: To be considered to receive our photo want list for each issue, please send a selection of your work – including a stock list if you have one. 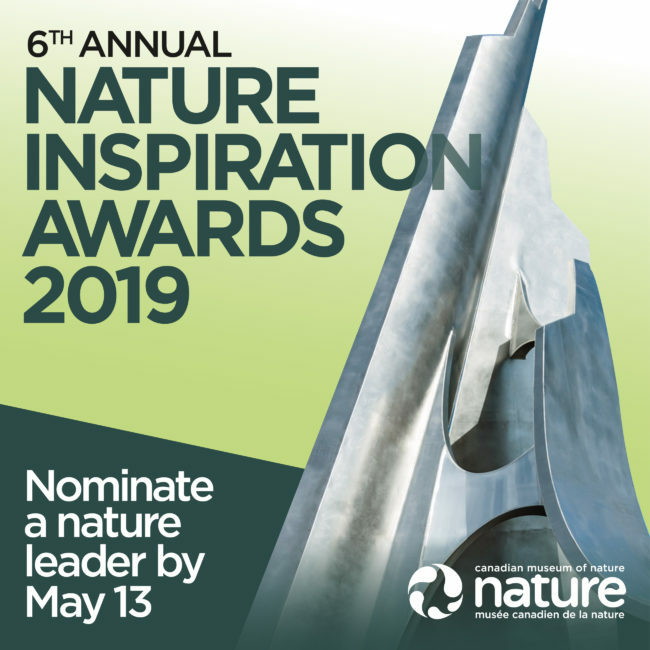 Email your submission to Noah Cole at noahc@ontarionature.org. Please label all photos with your name and the subject matter. Inquiries: John Hassell, Editor johnh@ontarionature.org.